Hello and welcome to my record auctions! Please read on for full details of the records I am selling which are from my own personal collection, cleaned using professional record cleaning machines, given new inners and protective covers and properly packed for safe, secure shipping all over the world. If you just want to skip to the details about this particular record, see the text in red below and check out the photos above by enlarging and scrolling through. I am a lifelong record collector selling records I have accumulated since the early 1970s. Most records have been only been played on high quality turntables such as Linn, Rega, etc. I often taped them for my own personal use when new, then CD came along and, as a result, most records have only seen occasional play and have been extremely well looked after. My records are all vintage pressings (1st, 2nd and subsequent) from the 60s/70s/80s/90s. They are not modern re-issues which in my opinion often sound second rate compared to the original analogue pressings. To truly appreciate the magic of vinyl you need to seek out the originals from the heyday of the LP record. For many, the pleasure of owning a vintage vinyl record is that sense of connection with when the music was released in its original format. When I use the term "vintage" in my listing titles it is purely to differentiate them from the ever increasing amount of modern re-issues. Please read the specific listing details in red below for full information. When playing many of my records for grading purposes I have been amazed by the sound quality. Vinyl often sounds full bodied with excellent dynamic range and impact. I think the original analogue mastering for some records may have bettered the subsequent digital mastering for CDs or downloads, or possibly some master tapes deteriorated prior to digital versions being produced. I'd love to keep all my records but I don't have the space these days so I need to reduce my collection somewhat before it is forced on me! Please read the description in red below for vinyl condition (as per the Record Collector Grading System). My records are supplied beautifully clean because they have received proper storage and care. All my records have been cleaned using high quality Record Cleaning Machines (either a £3,000 Keith Monks Omni VII RCM or a Moth Pro Mk II RCM) and the best record cleaning solutions such as "Art Du Son". Not only does this wet clean/vacuuming process remove any dust and surface marks, it also significantly reduces background noise and many argue that the lower noise floor results in opening up of the sound and improved fidelity. Following cleaning, records are placed in new Goldring Exstatic inner sleeves and the sleeve is given a new plastic outer protective cover. The sleeves vary in condition but most are excellent just showing the usual signs of storage. Most have been stored in plastic protective covers. I try my utmost to provide accurate descriptions, test playing all records. The quality of my records is reflected in the excellent feedback I have received from satisfied buyers, many of whom come back for more. I provide detailed photographs to illustrate the quality. A word about hairline marks. It is almost impossible to find any non-sealed record without any hairline marks - many had them from new, particularly if sold with cardboard inner sleeves. They are a result of storage and use and have little impact on sound quality. Likewise, very few original vinyl records lie totally flat. As for background noise, all records will have some background noise which varies wildly and often reflects the very variable pressing quality. I only draw attention to marks, warping or background noise in my listings if I consider them significant. Records are test played on a variety of turntables including the latest Rega Planar 6 and Technics SL1200GR. These are equipped with a range of Rega, Audio Technica and Nagaoka moving magnet and moving coil cartridges (including the latest Rega Ania MC cartridge). Replay is through superb NJC Reference Series phono stages and pre-amplifiers to revealing studio monitors or top of the range Sennheiser headphones. This enables me to undertake careful evaluation of the record quality and grade accurately. I take my grading very seriously - I often provide a photograph of the grading session. 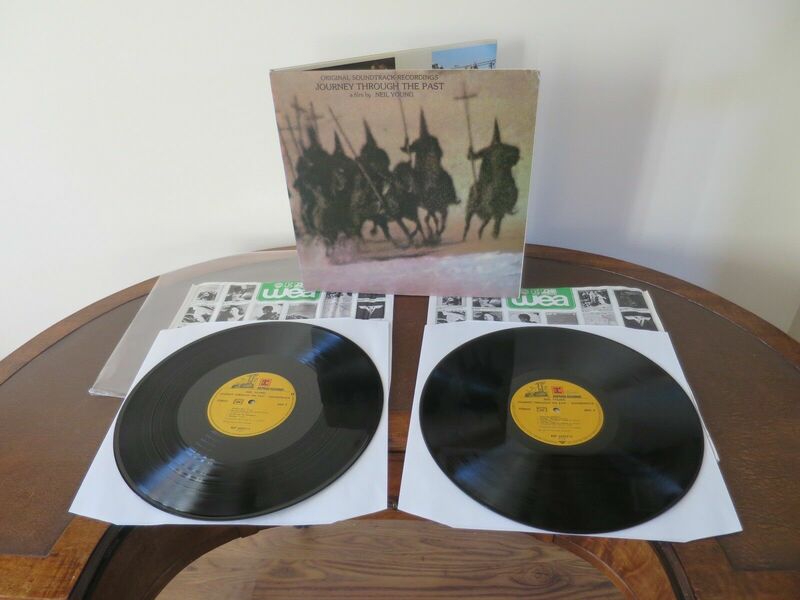 This auction is for Neil Young's superb "Journey Through The Past - Soundtrack" Double LP on the Reprise Records label REP 64015. Matrix marks A/B/C/D2, FIRST German Pressing. "PF" etched in dead wax. Vinyl grading is Near Mint according to the Record Collector Grading System. It appears unplayed prior to my test plays. A SUPERB "Time Capsule" or "Vault" copy. Test played superbly with wonderful audio and low overall background noise. The gatefold fold-out sleeve is in SUPERB overall condition as, in recent years, it has been stored in a plastic protective sleeve - see photos. Please take the time to click on the MAIN PHOTO above to enlarge and then scroll through the photos to check out the quality of this LP. Pictures speak more than a thousand words! Please see my feedback, particularly on other records I have sold, and thanks for looking. I'm happy to answer any questions. I dispatch worldwide in reinforced heavy duty LP mailers with cardboard reinforcements either side. I also use heavy duty packaging tape. I separate the LP from the sleeve when packing to preclude any damage to the sleeve in transit. Such care and attention to packing is normally demanded by the discerning record collector. UK: 1 record £3.75, 2 records £4.50, 3 records £5. EU: 1 record £5.75, 2 records £7, 3 records £8.00. International: 1 record £9.50, 2 records £11.50, 3 records £13. If you have bought more than one record please request an invoice from me with combined postage prior to checkout. Some countries may require tracked shipping (or indeed the buyer may want it for security) so please ask.